If you ask me what Parker is, I would tell you a pen. If you ask me what Bordeaux is, I would tell you it's a lovely color on a pen. Yes, here is a pen aficianado sharing my passion on fine things. I'm Twinsen, a HOFWs helper who is inquisitive on anything quality made. Thanks to Sean, a genteel man, I was ushered into the realm of quality wines and gourmet food. The fountain pen shown above is a Parker Duofold Centennial Big Red during early 90s, a very sought-after model among pen collectors. At the end of World War II, General Douglas MacArthur also used his 20-year-old Duofold to sign the document officially ending WWII. I am lucky to have this modern Big Red in my collection! - The history behind is crucial if you want a better understanding on them. How do pen manufacturers craft their pens in accordance with stringent standard? How do chateaux carry out their own vinification so as to meet the expectation of fine wine connoisseurs? 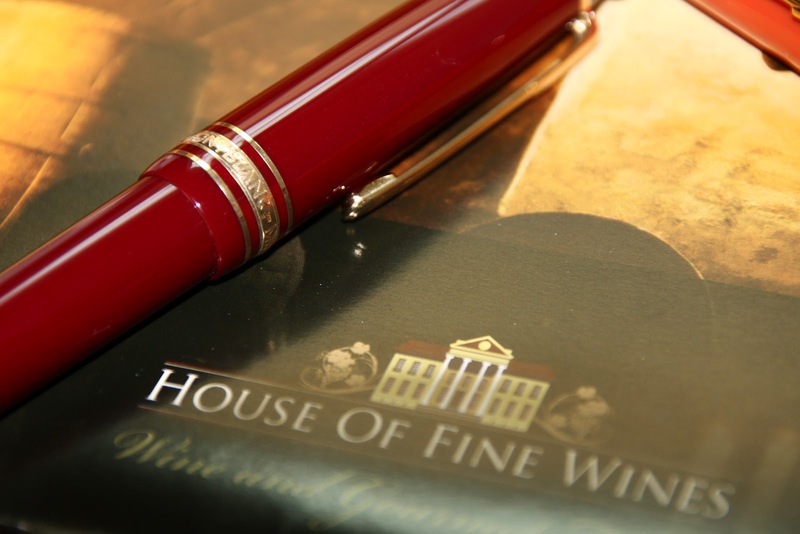 Both wine and pen have long history behind them. - They comply with “don't judge a book by its cover” principle. Some sophisticated label and handsome pen might disappoint you while some minimalistic label and unassuming pen might surprise you. - They both require knowledge. I cannot tell you a pen’s performance unless I know deeply about it. Likewise, I know very little about wine because HOFW staff are professional to recommend wine for me. - They are both good to consume. - The nuance are truly exquisite in fine wine and fine pen. The connection between wine and pen should be much more than these initial impressions. 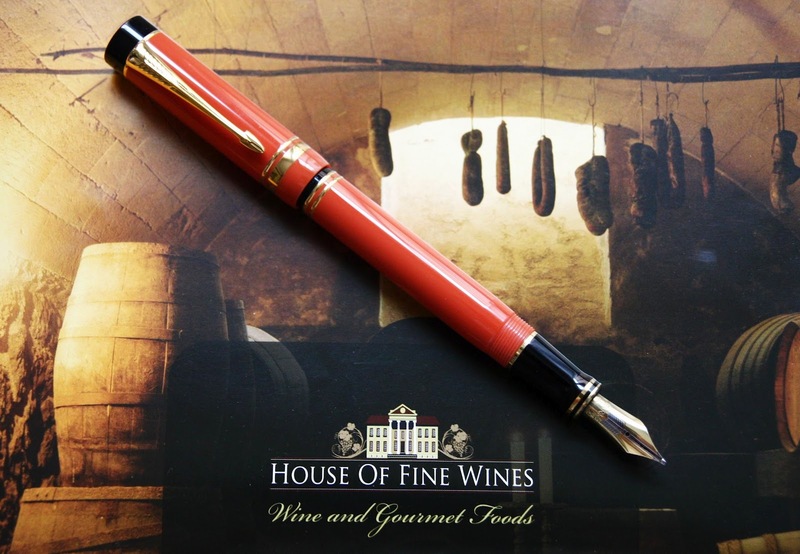 The blood (Wine: liquor , Pen: ink) running behind them formulates the passion of life. When you use them aptly in the right time, they communicate with you as well as the viewers. If you know how to savor them I believe each sip of wine and each stroke on paper will engender joie de vivre to you. Writing instrument, as such, is a tool to express your thought on paper. 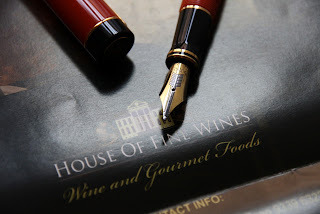 From now one, why don’t we grab a glass of fine wine, taste some fine food, use a fine pen(in fine nib) to write some fine thought under some fine music? I am sorry for my persistence on quality-made objects which are the motivation why I want to learn more in House of Fine Wines because they offer nice wine and food. After my experience in pet fair, I have a new definition for Parker and Bordeaux, they can now be referred to Robert Parker and a red wine respectively. I had been to Chez Patrick Restaurant on Peel Street once for foie gras crème brulee. I love it! Greg, a man of acumen, offered me a whole foie gras after the fair. I have been searching for the recipe last night and it seems I could not find the right one. I hope I can make my own soon. I am looking the different manifestations of fine food. I know keep trying is the right key. I’ll keep working hard and learn more about wine and food! By the way, is there any correlation between Montblanc and Sauvignon Blanc?